With Nikes FC247-collection you can control the game anytime, anywhere, whether you are playing on artificial grass, indoors, or on asphalt out in the yard. If you have the technique to light up the sky, then Nike launch a range of completely new and sharp colourways, which will match your game perfectly. Football is a fantastic game and if you are, like us, one of those people, who just cannot leave the ball alone, no matter where you are, now is the time to listen up. Nike have made a special range of football orientated footwear, which means you can always play the beautiful game, whether you are playing on turf, on an indoor court, or out in the concrete backyard. The summer looks to have gotten to Nike too, because the sunny weather looks to be reflecting in their new colourways for the FC247-collection. Their Bomba II, Lunargato II and Elastico have been given a serious fresh overhaul, which has resulted in three sharp and crispy new boots. The Lunargato II is the shoe for you, when you are taking to the streets, for a game with your friends down at the local asphalt pitch. It is made to be quick, agile and to assist the small dribbles, the quick changes of direction and the supreme ball control. It is a shoe, which has been thoroughly tested and developed when compared to the first version of the boot. Now Nike spoil us with a fresh new colourway, with which you can dazzle your opposition, when playing the small-sided street game. The cool neon colours in some way remind us of the second last colourway of the now retired T90 Laser IV boots, which we think is an excellent way to help continue the legacy of this already sorely missed boot. 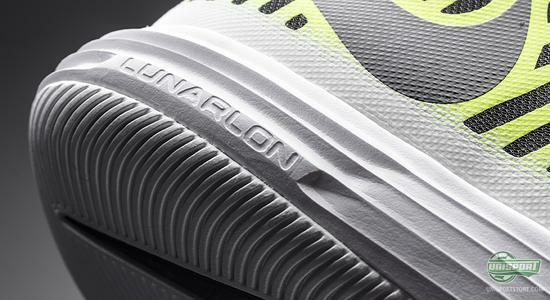 You can already pre-order the Nike Lunargato II right here, with an expected delivery in the beginning of July  just 76. 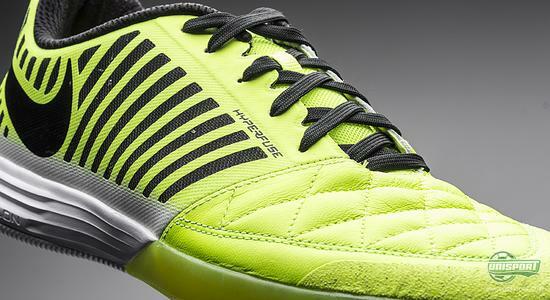 If the boot doesnt command enough attention through its colourway, then its qualities will. On the medial side of the boot and on the front foot, Nike have placed an incredibly soft and supple leather, which has significantly improved when compared to the first version of the Lunargato. It has a reduced break-in-period and quickly ensures a comfortable and personal fit. On the mid foot you find a dynamic mesh-material, which first and foremost gives crucial free movement and great breath ability. At the same time it locks certain areas in place, so the boot has the perfect balance of movability and stability. Quick and unrestrained movement is naturally important in street football, but it is just as important to have the necessary stability, because as most of us have tried, it is no fun falling over on a street pitch. Asphalt is also a harder and more detrimental to your joints, than grass would otherwise be. 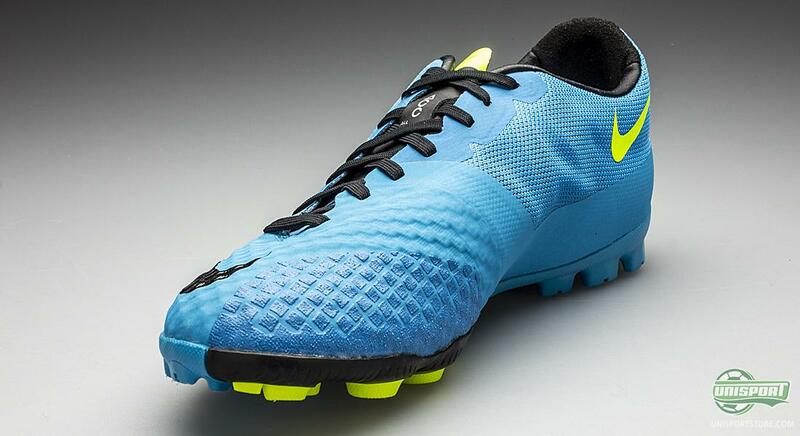 This is something Nike have taken into consideration, when designing this shoe. Nike have borrowed the innovative Lunarlon-foam from their running shoes, which weighs close to nothing, while still having the ability to absorb shocks and jolts. They have placed this on the hell, where it is most necessary. 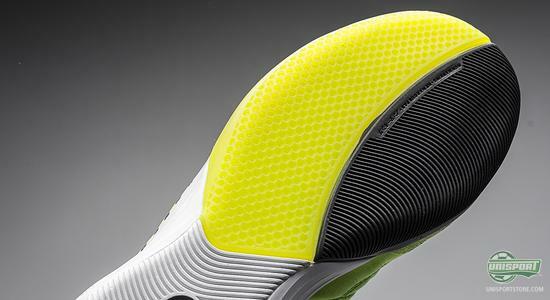 The rest of the Lunargatos sole greatly resembles the Elastico Pro II, where it also has the smart flex-zone around the front foot, which makes quick turns unhindered. 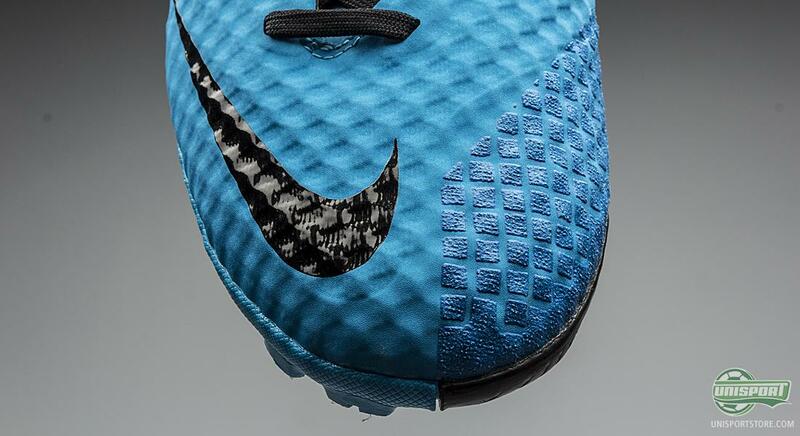 The sole is a mix of a herringbone pattern and dots, which ensures grip in all directions. 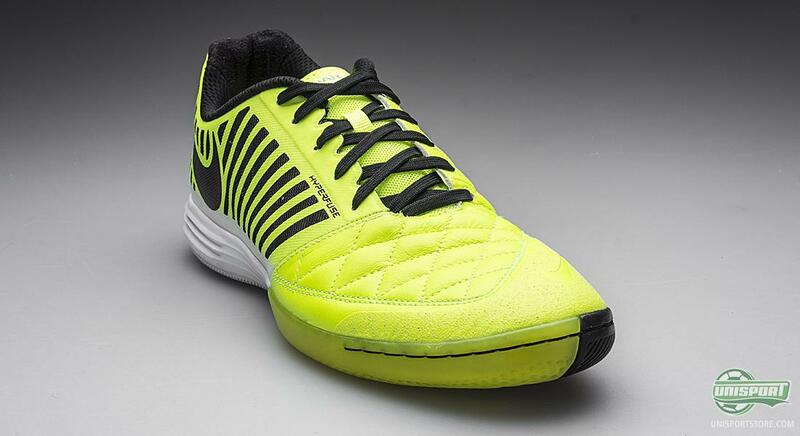 All in all you get, with the Nike Lunargato II, a really good shoe, which is especially designed to let you take on the rough street pitches, whenever there is a ball around. But if you move away from the asphalt and find yourself playing on turf, there is a different boot, which suits your purpose, which we take a look at here. The Nike Bomba Finale II is made to help you show off your qualities and show your skills, when playing on turf and artificial grass alike. 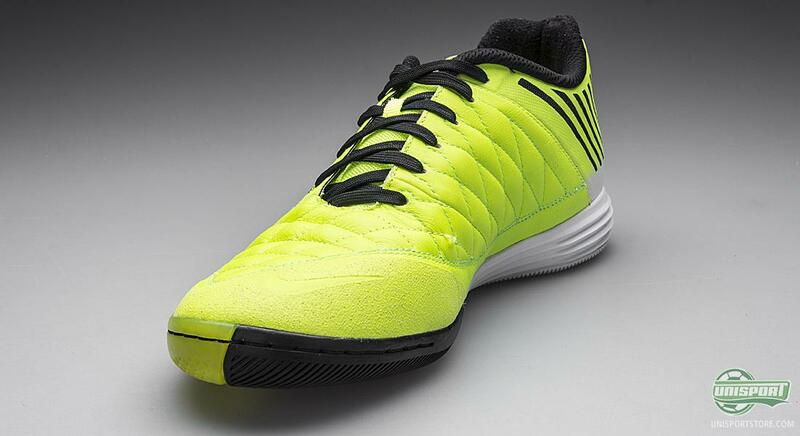 It is a boot, which gives maximal grip and control on a surface, which would otherwise be tricky to play on. 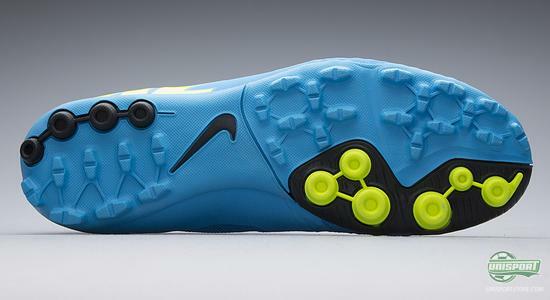 The boot is produced with a great number of Nikes latest and most innovative technologies. To make sure you are also up to date with the seasons, Nike have launched the boot in a new elegant and summery design, so the boot is as fresh to look at, as it is to play in. 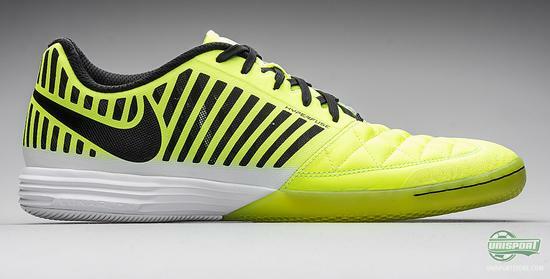 You can now pre-order the new Nike Bomba Finale II right here  just 87. There can be no doubt that this is a boot bread for a single purpose, which is playing football. First and foremost it is worth noting that Nike have, on this boot, implemented their brilliant ACC-technology on the upper. It stands for All Conditions Control and makes sure you have the same grip, when playing in wet weather, as you would otherwise have in dry conditions. You also dont need to be afraid of the effects wearing off, because ACC is not a coating, but rather a technology that has been worked into the upper during production. The upper material used on the Bomba, is the same the one used on one of the hottest boots on the market right now. It is the new NikeSkin-material, which is incredibly light, supple and offers amazing breath ability. It is perfect for football boots, as it shapes itself after the foots shape, so you get a tight fit and barefoot feel, which is something many players, including Neymar, have personally requested in their boots. One of the most important attributes on the football pitch is having a hard and precise strike, which is something Nike have worked hard to help you get. They have changed the stitching, so it is asymmetrical, thus giving you a larger and plainer strike surface. The small dents in the upper also give increased friction between the boot and ball, so you have a greater chance of putting that unpredictable swerve on the ball. Crucial to the boot is the stud-configuration. 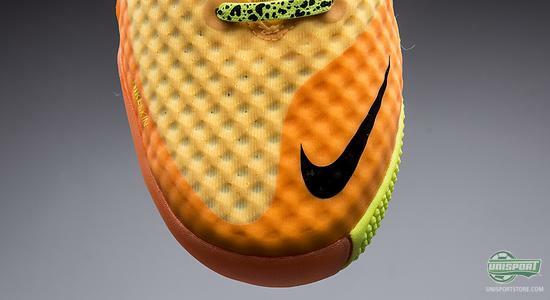 Around the front foot Nike have placed a number of conical studs, which are made to help the quick rotations on the pitch. These conical studs are accompanied by a number of bladed studs, which firmly grip the ground, providing that burst of acceleration. Should you be so unlucky that it started raining and you were forced indoors, then Nike have just the thing, which fits the occasion. Even though we dont hope for rain, this shoe might just make it worth stepping onto the indoor court for some time. 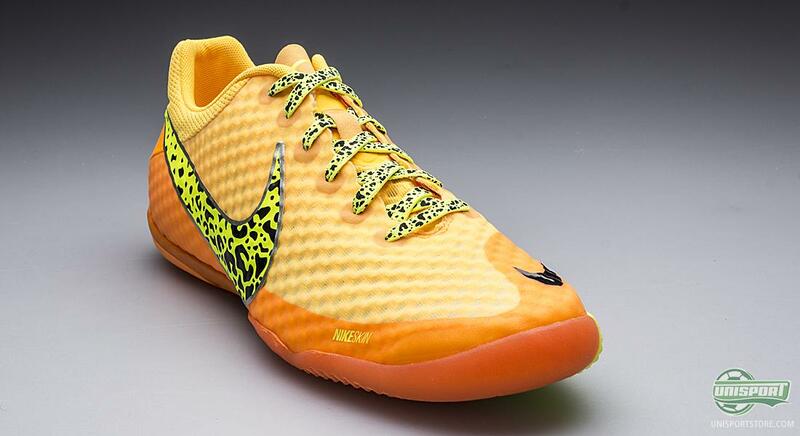 Nike Elastico Finale II is a football shoe, which is designed for the technically gifted player, who loves to play classic indoor football, or futsal. 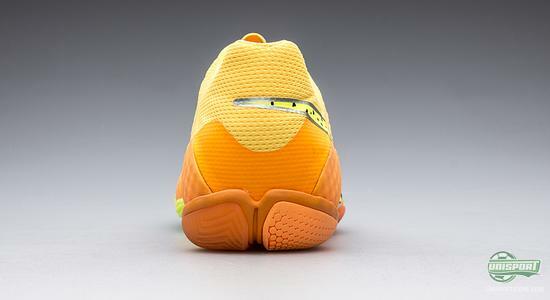 The shoe is made to let you do the small dribbles in tight spaces and constantly having the maximal feel for the ball, so you can outfox your opponent at any time. 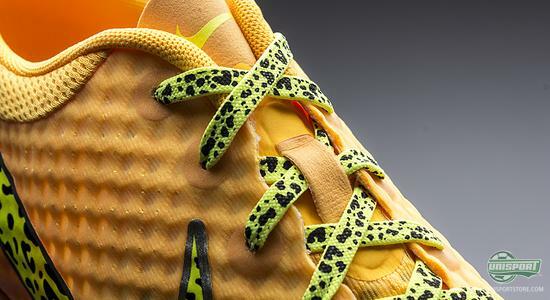 Nike Elastico Finale II has quickly turned into a favourite and has gotten the stamp of approval from Barcelona superstar Andres Iniesta. 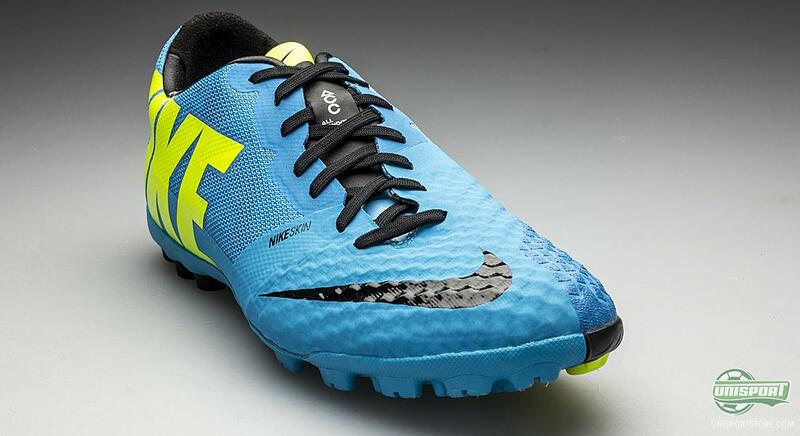 We are also sure that the Spanish midfield ace would give the bright new colourway, the thumbs-up. 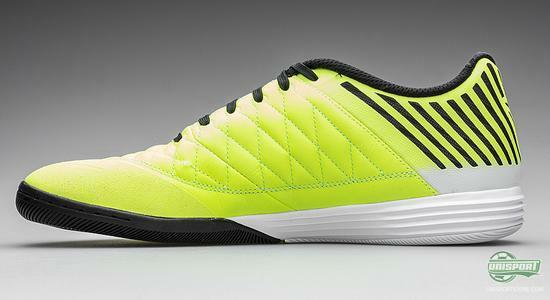 The new Elastico Finale II lands in a hot new Laser Orange/Volt colourway, which will illuminate any indoor hall. 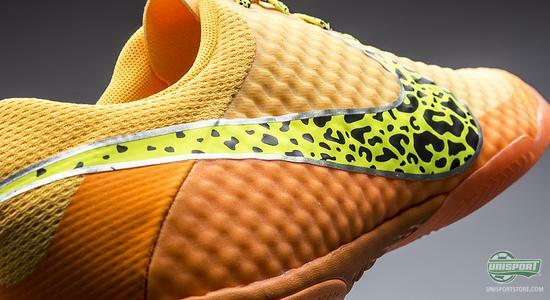 You can already now pre-order the new Nike Elastico Finale II right here, with an expected delivery date in the beginning of July  just 76. Just like on the Bomba Finale II, this shoe is made with the incredibly nice synthetic microfiber upper, NikeSkin. It is, as previously mentioned, very flexible and light, so it shapes itself after your foot, to give a tight and comfortable fit. On the inside Nike have fitted a support band, which as the name suggests, gives added support, so you have the necessary stability. And to give the maximal ball control, the upper is dimpled, to create added friction between the ball and shoe, so you can improve your own touch. 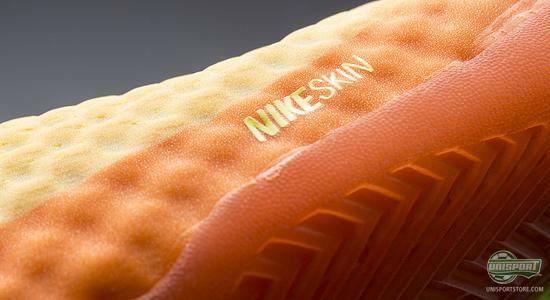 At the same time the NikeSkin is perforated to increase breathability and make it more comfortable to play futsal in, where the temperature of your footwear can quickly reach sweltering heights. The sole of the boot has also been an area of focus from Nike, while developing this shoe. 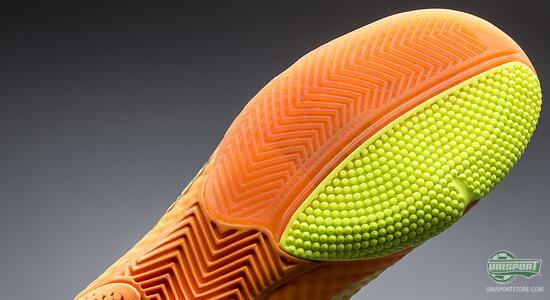 Nike have answered the prayers of players, who wished for better grip on indoor courts, as well as an improved grip on the ball, when controlling it with the bottom of your foot. 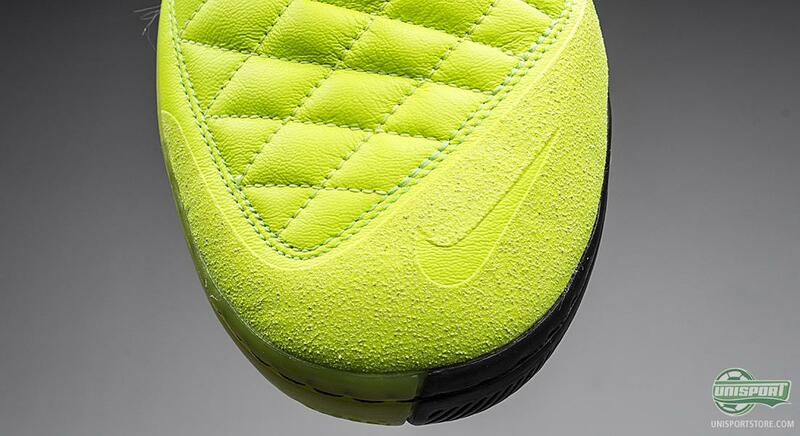 Nike have here combined the herringbone pattern, with the dotted area, which ensures sublime grip. 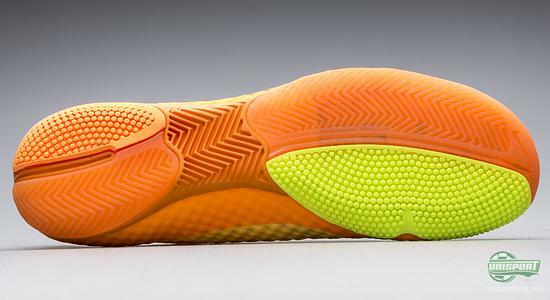 Along the outsole runs a flex-zone, which is extremely flexible and allows for lightning quick twists and turns on the court. It is an important and decisive weapon on the indoor court, where the tempo is high and the time to react short. 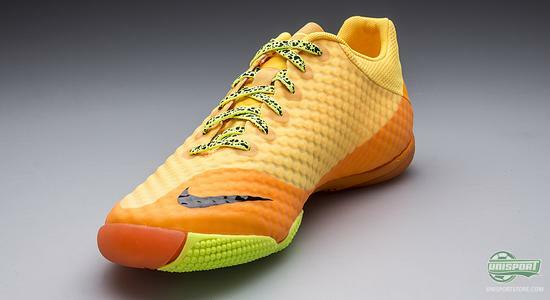 With this new Nike Elastico Finale II in the cool new Laser Orange/Volt colourway we made it to the end of the fresh new and very summery new releases in Nikes FC247-collection. They will help you stay in complete control  anytime, anywhere. Would you like to see even more of the cool FC247-collection, then you can explore our campaign-site right here, where you can also rewatch Jakobs interview with Colin Eder from Nike. He explains all there is to know about the FC247-collection, when the new version was launched back in March. Here at the Unisport office we are incredibly impressed with Nikes FC247-collection and when we saw the new colours we were completely sold. 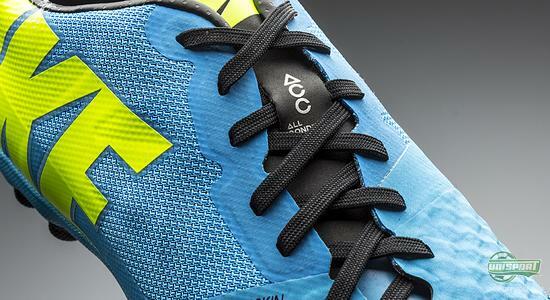 What do you say to the new colours from the FC247-collection? Will you be playing football Anytime, Anywhere in one of the new FC247-boots? As always we would love to hear your comments here, on Facebook, or Twitter.